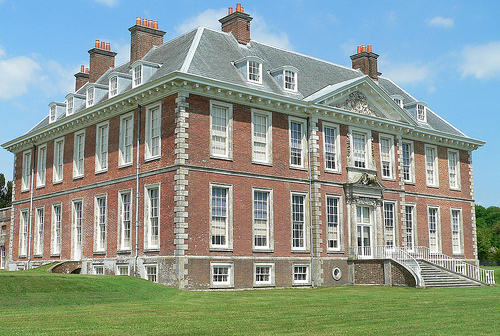 Uppark is a 17th-century house in South Harting, Petersfield, West Sussex, and a National Trust property. It was built for the first Lord Tankerville c.1690 and subsequently sold to Sir Matthew and Lady Sarah Fetherstonhaugh in 1747. 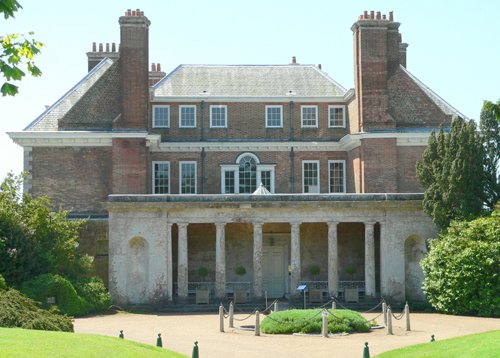 They redecorated the house extensively between 1750 – 1760 and introduced most of the existing collection of household items displayed today, much of it collected on their Grand Tour in 1749 – 1751. Their only son, Sir Harry Fetherstonhaugh, added to the collection and commissioned Humphry Repton to add a new pillared portico, dairy and landscaped garden. Sir Harry is perhaps best known for employing the fifteen year old Amy Lyon (later known as Emma Hamilton) as hostess and entertainer at a lengthy stag party at the house. She is said to have entertained Sir Harry and his friends by dancing naked on the dining room table. It is possible that some chimneypieces came from Dover House (where I have also worked). In the 19th century stables and kitchens were added as separate buildings connected to the main building by tunnels. On 30 August 1989 the building was devastated by a fire caused by a workman’s blowtorch whilst repairing lead flashing on the roof, just two days before the work was due to be completed. The fire broke out during opening hours. 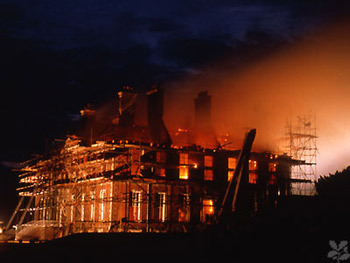 Many works of art and pieces of furniture were carried out of the burning building by members of the Meade-Fetherstonehaugh family, National Trust staff and members of the public. Although the garret and first floors collapsed onto the lower floors and the garret and first floor contents were lost completely, the floors largely fell clear of the ground floor walls and much of the panelling and decoration survived. Much of the contents of the ground floor was crushed but not burned; metalwork was able to be straightened and cleaned, crystal chandeliers were able to be reassembled, and even the elaborate tassels on the chandelier ropes were able to be conserved. The decision to restore the house came after it was determined that restoration would be a cheaper insurance settlement than complete payout for a total loss. Most of the pictures and furniture in the house were saved. The building has since been completely restored with many lost crafts relearned in the restoration process, and it re-opened its doors in 1995. I worked as part of a small team on the analysis of the painted surfaces. The interiors were largely redecorated following our reports. That’s quite a fire! Pity that Hafodunos Hall was not in the NT, then perhaps you might have worked on that too.